Thank you. We appreciate you, and all the fun we have searching for unique, high-quality wines to share with you. May’s selections have arrived and we are again very excited for this month’s club! Cheers to all who came in during the Urban Wine Walk on Saturday, May 6th. We had a lot of fun and enjoyed the lines of new people who hadn’t been in the shop before. We are also very thankful for any of you who stopped by and were patient with us. Not often do we have a line out the door and through the lobby! This month’s selections were based on a bit of history and a newer trend. In order to explain what we mean, we will need to start with a bit of history. 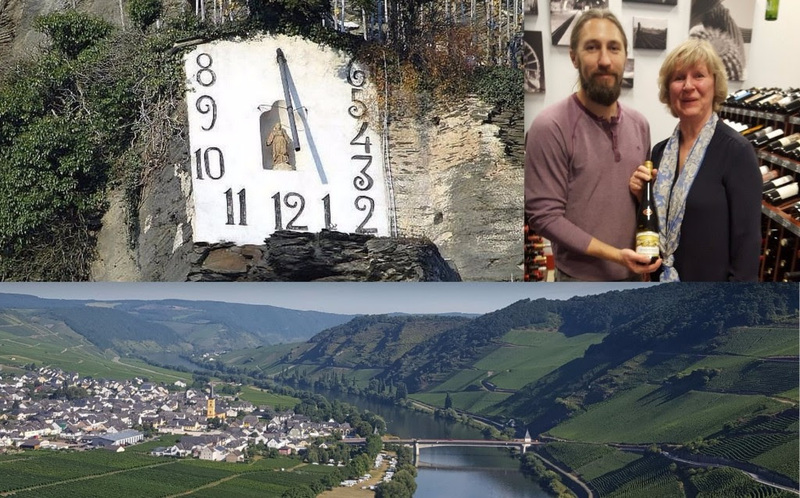 The Great Mosel Valley in Germany carries an amazing cultural timeline. One in which Vitis vinifera plays a major part in the development of the area. As culture developed along the Mosel Valley, the vines grew up along the steep slopes that rise above the Mosel River. Cultivating these steep slopes was, and still is, a difficult task. However, the amazing benefits of the slate within the ground and the additional sunlight caught from the steepness of the pitch created ideal vineyard sites that would present some of the noblest wines of the world. This combination of quality and difficulty of work would create a lighter side of measuring one’s time in the vineyards, the sundial. The slopes along the Mosel created a perfect natural mantle for the placement of sundials. Carved directly into the stone, sundials were used to inform the community of the time. Along the Mosel, there were once hundreds of sundials, some separated by only a few hundred meters. Thus was the case in Wehlen. Wehlen became known for its amazing Rieslings and sundials that humored the community and its vineyard workers. In this part of the world, sundial mottos centered on a few themes. A couple of our favorite quotes: “Do like the sundial; count only the sunny hours!” and “Now is the time to drink.” With mottos like these, it would be hard not to smile while hiking up and down the steep vineyards. Wehlen soon became known for one particular sundial, which happened to be placed directly across from the city and faced southwest. It was carved into stone in 1842 and would become known as The Sundial of Wehlener Sonnenhur. The family responsible for the Wehlener Sonnenhur vineyard and sundial was the Prüm Family. Joducus Prüm carved out the historical landmark. S.A. Prüm comes from the same Pruem family responsible for the Wehlener Sonnenhur. The family has been cultivating grapes and making wine since 1156! Best known for their amazing Riesling selections, such as the Wehlener Sonnenhur Blue Slate Kabinett (and many others), the family also offers a few additional varietal options – one being “Spatburgunder,” or Pinot Noir. And even rarer, a Rosé of Pinot Noir! Sourced from Bernkastel vineyard sites, this Rosé of Pinot Noir will showcase all the bells and whistles you’d expect from a Provence-style Rosé, but instead made with Pinot Noir. Enjoy just slightly chilled. Not to be outdone by the Pruem family history, we went to Bordeaux and found an offering from the oldest winemaking estate in the Médoc! 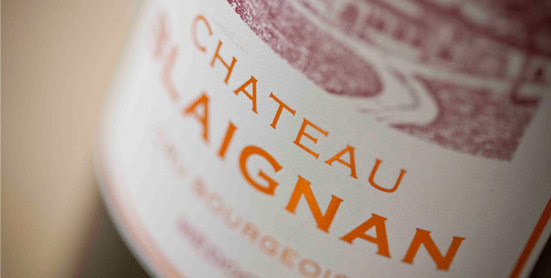 Developed in the 15th century, Château Blaignan produces wines that come from its estate vineyards, planted with Cabernet Sauvignon (50%), Merlot (41%), and Cabernet Franc (9%). The Château owns 85 hectares of Vitis vinifera ranging from 25-45 years of age. This vintage is made up of 55% Cab Sauv and 45% Merlot. Bonne dégustation! 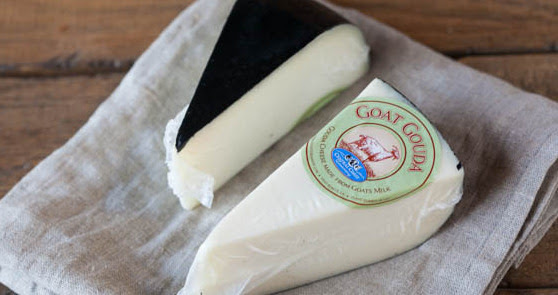 This month’s cheese selection is from Central Coast Creamery in Templeton, CA. It is an amazing Gouda made from 100% goat milk and aged for a minimum of five months on pine boards. A sweet caramel aroma is met with aslight nutty texture and sweet finish. We have this selection prepackaged in varying sizes or available at $24/lb. Stop by the café and say cheese!